When your crew needs to dig a ditch or a channel, a trencher can do the job. These machines are made for tough tasks on residential, commercial, or industrial sites. Since they come in a range of sizes and capacities, you can find the right trencher for any job. 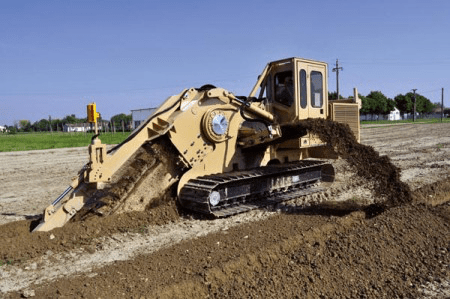 Find out what trenchers can do, check out popular models, and learn why you should rent one of these machines for your job site. Trenchers have tackled tough jobs for over a century. Laborers used early versions of these machines in the late 19th century. Then in 1902, James B. Hill patented a model, known as the Buckeye No. 88. Though this steam-powered ditcher could dig basic trenches, it was bulky and tough to use. Companies like Cleveland Trencher Co. also developed their versions. However, several decades passed before any major changes made trenchers easier to use. In the mid-20th century, new technology led to key advances for trenchers. Hydraulics gave these machines more power and made them easier to use. New drive systems gave trenchers more ability to move forward as they dig. This feature sped up what had been a prolonged process. 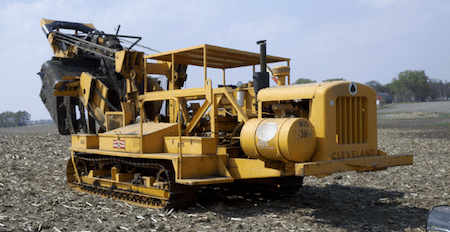 The average size of trenchers grew through the 1980s as these machines tackled large-scale jobs. However, some trenchers became more compact to handle specialized jobs. 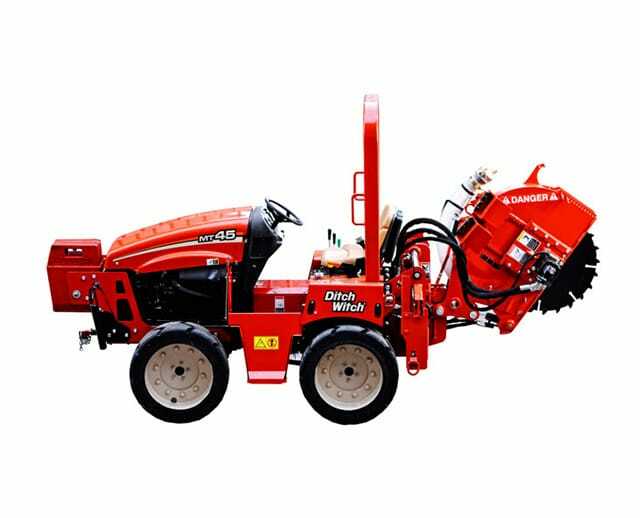 Today, these machines are available in an array of sizes to tackle any trenching job. As trencher technology advanced, so did safety options. Today, trenchers are safer than ever for your crew members to use. To stay safe, your crew should always do training, follow best practices, and know common hazards. These heavy-duty machines come in a few different styles. However, all models rely on similar technology to do the job. Trenchers use either gas or diesel for power. Smaller units use gas, while larger models take diesel. All models have drive systems, transmissions, and hydraulics to move forward and backward. These machines also have either mechanical or hydrostatic drive. The latter type relies on fewer moving parts. That often means smoother operation and fewer breakdowns. Trenchers rely on either tires or tracks to move. Smaller models have three or four wheels. Those with three wheels usually have two larger tires and one smaller tire under the trenching component. Heavy-duty models usually have tracks. A track system allows for greater traction and easier driving on rough terrain. Since tracked models are so large, you'll often use these on industrial sites or for civil engineering projects. To dig into the ground, trenchers use either a wheel or a chain. Both parts have teeth that cut into the ground. As they work, trenchers remove the soil, leaving it in a pile next to the machine's path. Operators can use the machine's control panel to raise, lower, start, and stop the wheel or chain. Most models can dig trenches within a certain size range. Smaller models can often dig trenches between 1 and 4 feet deep and between 4 and 16 inches wide. Larger trenchers can dig ditches up to 18 feet deep and 4 feet wide. Operators can preset the trench dimensions before starting the machine. This option allows for precise trenches on any job site. Trenchers also come with a wide range of horsepower options to ensure your crew has enough power. 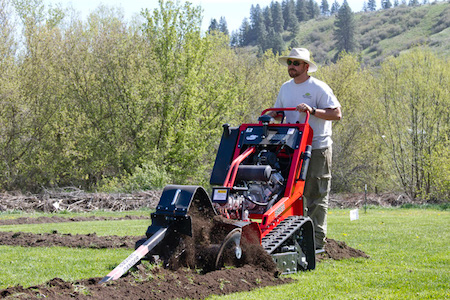 Smaller trenchers start at 12 HP, while larger machines can have up to 121 HP. Several patents cover trencher technology. Challenge-Cook Bros. Inc. holds the 1965 patent for a trencher machine. 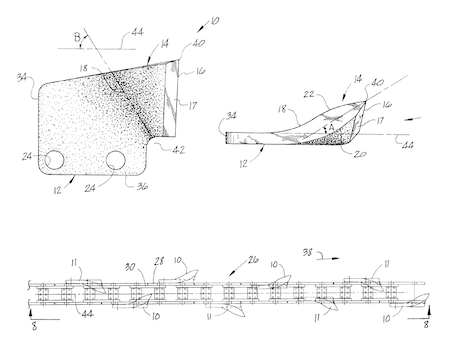 William D. Hunter and Ronald C. Becker hold the 2003 patent for trencher chain teeth. Vermeer Manufacturing Co. holds 1994 and 1995 patents for trencher steering and imaging technology. 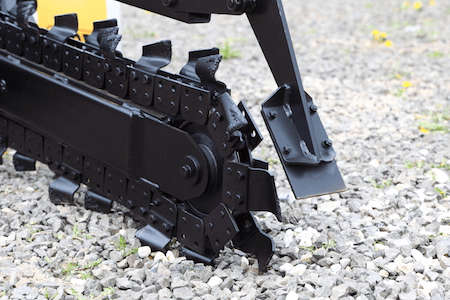 Along with choosing the right trencher size, you'll need to pick the ideal type. Take a closer look at the four main types to decide which is best for your job site. Walk-behind trenchers rely on the operator to walk behind the machine and pull it backward. 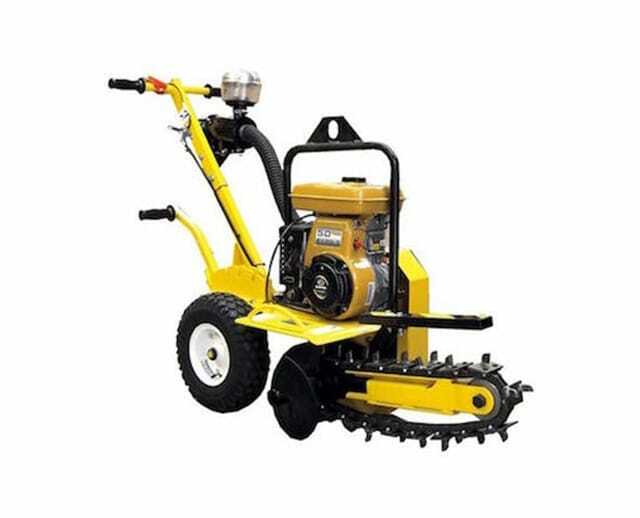 Since these models are labor-intensive, they work best for small jobs and shallow trenches. They use chains to dig trenches from 12 to 26 inches deep and boast 12 to 31 HP. These models can weigh from 250 to 1,300 pounds. Because these machines tend to be small, they work well in tight spaces. You can rent both wheeled and tracked versions to tackle any terrain. Ride-on trenchers have seats and steering wheels that enable operators to drive the machine. These models tend to be larger than walk-behind trenchers, making ride-on versions better for less confined workspaces. Ride-on models dig trenches 4 to 5 feet deep. Horsepower usually ranges from 49 to 131, and many ride-on models run on diesel. Some ride-on models can take attachments that give the machine more flexibility. Like ride-on trenchers, quad trenchers enable drivers to operate them. However, quad trenchers are larger and more flexible than ride-on models. Most quad models run on diesel and boast 74 to 121 HP. These large machines can dig trenches 6 to 7 feet deep. Along with their extra capacity, quad trenchers can use many types of attachments. With the right accessory, you can move material, backfill soil, or place piping. Microtrenchers can be small or large, but all use a wheel to make small, precise trenches. They can dig trenches between 1 and 5 inches wide and up to 20 inches deep. While most models work best on soil or other natural surfaces, these trenchers work on pavement. There, they can create trenches without damaging the road or asphalt. Before renting a trencher, you'll want to get familiar with the most common makes and models. Take a look at some of the biggest names in trenchers to find one that works for your crew. 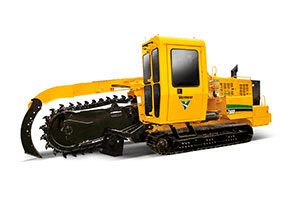 Barreto offers a small line of microtrenchers and walk-behind trencher models. Models from this company can dig trenches from 12 to 36 inches. Most Barreto models work best on small job sites with basic digging needs. However, Barreto's full-size trencher can tackle tougher terrain. Cleveland Trencher is the nation's oldest trencher manufacturer. While this company doesn't produce new models, it does offer replacement and custom trencher parts for over a dozen models. Cleveland Trencher has parts for everything from vintage walk-behind models to advanced quad trenchers. As many of these models are decades old, they're known for their durability. One of the biggest makers of trenchers, Ditch Witch, produces over a dozen models. This company makes everything from small walk-behind models to complex quad trenchers. 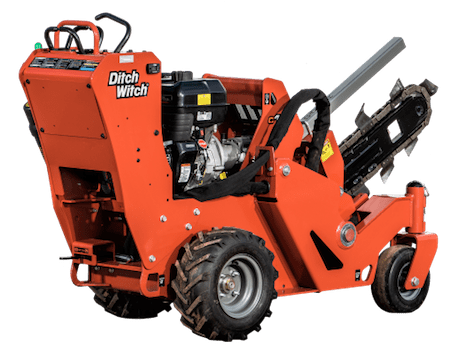 Ditch Witch machines are known for their reliability and great performance. Since many come with attachments, they are easy to use for many types of jobs. Tesmec specializes in large trencher models that come with heavy-duty attachments. This company also offers advanced technology for better control and navigation. Tesmec models work best for infrastructure jobs or utility projects. Vermeer makes large ride-on trenchers. Known as pipeline trenchers, these models can dig up to 18 feet deep and 4 feet wide. These heavy-duty trenchers can dig through earth and rock, making them ideal for rough terrain. Wolfe makes heavy-duty wheel trenchers. These models can dig trenches up to 8 feet deep and nearly 4 feet wide. These large machines use a track system to get around. They work best on large job sites with no space constraints. Trenchers may look simple. However, contractors can use these machines for many tasks. Since trenchers can dig anywhere from 18 inches to 18 feet, they can tackle jobs quickly and easily, saving your crew time and effort. From residential to commercial to industrial settings, these machines can do it all. Many contractors use these machines to dig trenches for placing underground utilities. Others use trenchers to dig channels for electrical wires. Still, others use these machines to create trenches for pipes and irrigation equipment. Because trenchers can dig drainage channels, they are ideal for water-based tasks. Trenchers can do basic digging jobs without extra accessories. However, with the right attachment, these machines can tackle more complex jobs. If your job requires you to lay pipes, you'll want to get a drainage pipe feeder unit. When equipped with this attachment, a trencher can dig the channel and feed the pipe into place. This option takes the burden off your crew and makes laying drainage pipe easier than ever. Many contractors also opt for trenchers with backfill blades. These attachments can move backfill into the trench after you've placed the pipe or wires. When you have a lot of trenches to dig, adding a backfill blade is a great way to speed up the process. 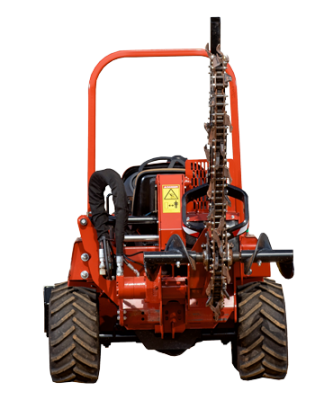 When you need to do some extra digging, consider renting a trencher with a backhoe attachment. This add-on aids excavation and can help break up tough surfaces. If you need to trench in areas known for rocky soil, consider adding on a rock wheel, too. If you need to dig a ditch or a channel for a job, you may have options other than trenchers. In fact, some contractors prefer trencher attachments over dedicated trenchers. Many machines can work with trencher attachments. Some excavators have trencher accessories that enable them to dig channels. Since excavators tend to be large, these models work best on large job sites with few obstacles. For smaller job sites, skid steer loaders may be better options. Many skid steer loaders have optional trencher attachments for digging shallow trenches. Since these machines are on the small side, they work best on residential and commercial job sites with limited space. No matter which machine you use, you'll deal with similar pluses and minuses. On the plus side, using a trencher attachment adds one more job to the machine's list of abilities. That makes the machine more versatile. It can also increase your return on investment (ROI). One major drawback of using an attachment is the potential for limited capabilities. You may be able to dig up to a few feet with a trencher attachment. However, these accessories may not achieve the 18-foot trenching capabilities that some models have. Also, using a trencher attachment means that the excavator or skid steer loader can't tackle other jobs at the same time. If you plan the day and each piece of equipment carefully, you may not have any issues. If you don't, your job site could experience delays and scheduling issues. Like most equipment, trenchers can cause serious harm without adequate training. To keep your team safe, ensure that every crew member completes trencher training before use. Every training program should include a few components. First, workers should complete classroom-style training. This can take place in person or online. Next, your team should get hands-on training with a trencher. This hands-on training can help your crew get comfortable with using the equipment on a job site. After completing a training session, your crew members should prove their competence by passing a test. Keep records of each crew member's training sessions. These records can help you keep track of who is qualified to use a trencher. Remember that training on one type of trencher doesn't prepare you to use all models safely. Require your team to complete training on each new trencher type before using it on a job site. Take the time to teach your crew basic safety tips, too. For instance, you should always review the manual before using a new trencher model. Make sure you understand where the controls are and how to use them before starting the machine. Before using a trencher, you should also inspect it. This pre-use inspection helps you identify problems before they cause injury or damage property. Encourage your crew to stay aware of people and objects nearby. Your team should always maintain a safe distance when using a trencher. Most models recommend a minimum distance of 8 feet. Make sure your crew members always wear protective gear when operating a trencher. Goggles can protect eyes from airborne soil, rocks, and debris. Hard hats can protect your team when using larger trenchers or digging through rock or asphalt. High-visibility clothing and safety-toe shoes can keep your team safe when working on active job sites. Your crew could encounter several hazards and problems when using a trencher. Make your team knows about these common issues and how to prevent them. Poor Traction: Trenchers can be hard to drive, even in optimal conditions. When you have poor traction, steering and digging can both be impossible. Before renting a trencher, confirm whether you need tracks or tires. If you opt for tires, make sure they have adequate tread before starting a job. Avoid using a trencher in muddy conditions to avoid serious traction issues. Bad Steering: Most trenchers are hard to steer. However, choosing a newer model will give your team a better chance of easier steering. When possible, choose a hydrostatic model, as these are easy to use, even on rocky terrain. Inadequate Power: Not every trencher can handle any terrain. Choosing the wrong trencher type can mean it doesn't have enough power to cut through the ground. Before you start the job, know whether you're working with soil, rock, or asphalt. Insufficient Depth: Each trencher can dig ditches of certain sizes. Measure what you need before you rent to make sure your trencher can do the job. Underground Obstacles: Hitting utility lines with a trencher can stop a job in its tracks. Never start digging until you know what's underground. Start by marking where you plan to dig. Then call the local utilities for help marking gas, water, and electric lines. Taking these steps can help your crew avoid the most expensive and time-consuming problems. Scheduling Issues: Working with local utilities is key for safe trencher use. However, the utility crew may not work on your schedule. Know how much lead time you have to give the utility to prevent delays or scheduling problems on your end. For most contractors, renting a trencher is a smart choice. When cost is a concern, renting is much more cost-effective than buying. Purchasing a new trencher can easily cost over $100,000. The price tag may climb even higher for quad trenchers or models with attachments. For such a large purchase, you'll need to raise capital. That could mean taking out a loan. Even if your business qualifies for a large loan, you'll tie up your credit on a single machine. You'll also have to make monthly payments for years to come. In contrast, renting a trencher often costs under $1,000. At BigRentz, trencher prices depend on the model and the rental period. Renting a small walk-behind model typically costs a few hundred dollars per day and less than $2,000 per month. These amounts tend to be much easier to factor into a job budget. Purchasing used equipment means a lower upfront fee, but older machines can cost you over time. Older machines lack the latest features and may need frequent repairs, which can cost you time and money. In contrast, renting a trencher gives you access to the newest technology. These features can speed up your job and increase your ROI. Since you only rent for the amount of time you need the machine, you don't have to lose money while the trencher gathers dust. When you rent, you don't have to pay for long-term storage either. Since storage can cost hundreds of dollars a month, renting can help you save every month. When you own equipment, repairs and tune-ups can be expensive. When you rent, you don't have to worry about those extra costs. Instead, BigRentz handles maintenance and keeps your equipment running smoothly. Moving equipment to a new job site can also be costly when you own. However, renting usually includes those costs. Since BigRentz handles equipment delivery, you don't have to arrange transportation, either. If you're like most contractors, you have a few questions about trenchers and the rental process. Get answers to frequently asked questions before you rent. 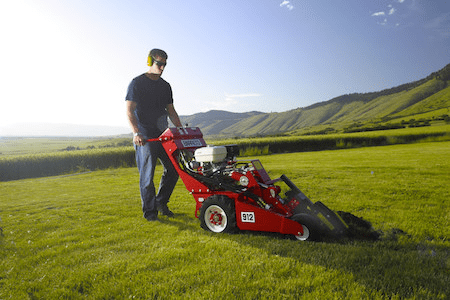 What type of trencher should I rent? Consider the job you need to do and the space you have to work with. Smaller walk-behind models are ideal for small jobs in tight spaces. Larger ride-on models are best for big jobs in open areas. What size of trencher do I need? Plan the job and know how deep you need to dig before renting a trencher. Always confirm the trencher specs before renting, and make sure the machine can do the job right. How long should I rent a trencher? To determine the total rental time, add up the number of eight-hour periods you'll need to use the machine. A one-day rental includes a single eight-hour session. A week-long rental includes five eight-hour sessions during seven days. A month-long rental includes 20 eight-hour sessions during 28 days. How do I arrange delivery? Call BigRentz to confirm that the trencher model you need is available in your area. Then arrange delivery on the day that works best for you. In many cases, you can schedule same-day or next-day delivery. Where can I rent a trencher? BigRentz has over 8,000 delivery locations in over 500 metro areas in the United States. Call BigRentz to confirm the closest location to you. Who should I call for service? Always call BigRentz for operational issues or service needs. Your rental coordinator can answer questions or arrange tune-ups right away. Ready to find the right trencher for your job site? Call BigRentz at (888) 325-5172 to confirm options in your area and schedule delivery. Whether you need a walk-behind model or a ride-on option, BigRentz has the trencher you need to do the job.